The most common technology used in 3D food fabrication is the fused deposition manufacturing, which involves the application of material extruded from the nozzle layer-by-layer at a slightly higher temperature. Fused deposition manufacturing is also known as hot melt extrusion because a hot melt of the ingredient to be fabricated is used as the printing material. This technology is most commonly incorporated in the 3D chocolate printers. The printers incorporated with this technology can be equipped with one or more extruders, which allows simultaneous printing of various components. In this technique, the properties of food product fabricated, such as moisture content, rheological aspects, crosslinking mechanisms and thermal properties, are taken into consideration while printing. Also, innovations in the technology have enabled the use of dual-feed extruder which makes it possible to attain a third color by extrusion of two different colors in right proportions. 3D food printing machines based on fused deposition or extrusion technology can be used for chocolate and soft-materials printing. 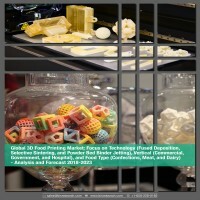 The major food verticals in which 3D food printing technology is used. The commercial segment includes bakeries and confectioneries, high-end restaurants, and retail stores. This segment is the largest user of 3D food printing devices. This technology enables the user to bring artistic capabilities into cooking and expands customization features to the culinary industry.